How to choose the right granite color for your home. Granite is a natural rock that is formed deep on the surface of the earth. For this rock to be classified as granite, it must consist of at least twenty percent quartz. Most natural granite slabs have either a pink or gray undertone. This is because quartz is present in large quantities. 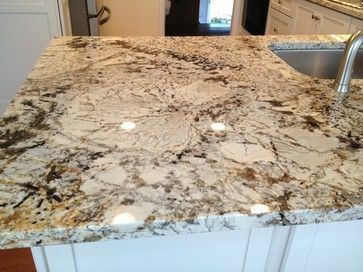 However, once the stone has been added to the granite, then the natural quartz color is not so visible and one can in fact purchase granite in most any color. Many people use granite either in the kitchen or bathroom. Granite is an excellent material for counter tops, back splashes, and even table tops. It is not only aesthetic and good looking but also durable and resistant to humidity and mold. White Colors – white granite colors are ideal for a room that has dark colored floors and walls. Bright colors contrast nicely with dark ones and can also brighten up a room that does not get much natural light. A light colored granite slab can also make a small room appear larger than it is. There are numerous light patterns to choose from; many of these have either a swirl or speckles. On the other hand, it is also possible to purchase a solid colored granite slab that does not have designs. Dark Colors – Dark colors command attention and are sure to be noticed. Black is a popular color choice, as it matches with most kitchen cupboards and bathroom vanities. It is a timeless classic that many find appealing and attractive. However, black is by no means the only dark color. It is also possible to get dark colored granite with speckles or swirls, and many people find these designs to be very attractive. Combining Colors – It is also possible to mix colors, and this can create a nice effect. If the countertop is a dark color, then try installing a light colored backsplash or vice versa. The contrast does not have to be blatant; in fact, a slightly darker shade of the same color is often the best option. If you are remodeling your home kitchen and bathroom, you should consider the many advantages of installing granite counter tops and back splashes. Granite is a beautiful material, and there are numerous granite colors to choose from. A wise homeowner will look at various color choices and see which one will match best in the room. While a lot depends on a person’s tastes, it is also important to consider the size of the room, how much lighting it has the wall and floor color. A wise homeowner will choose granite slabs carefully so that they will enhance the room’s decor.